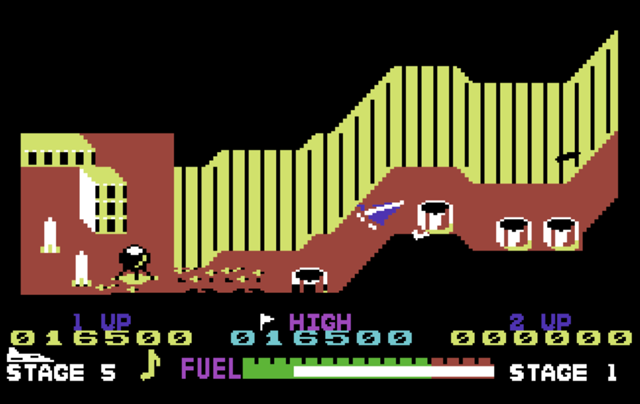 For those that don't remember Scramble, it was a classic early horizontal shoot-em-up where you had to blow up ground targets and missiles with bombs or bullets and navigate increasingly difficult terrain. It was so popular, it spawned many home computer conversions, and also this great fun isometric 3D version from LiveWire Software UK (1984). It's Zaxxon meets Scramble with all the best features of the original game, plus an extra dimension. You can shoot the missiles with bullets at the riskier low altitude, or fly higher and bomb them from above. 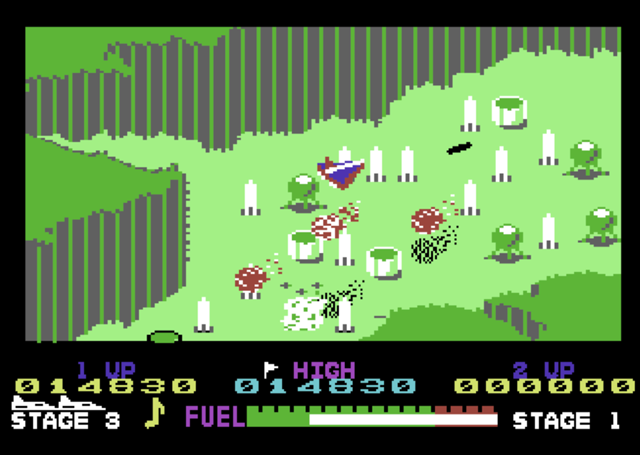 The landscapes change colours as you reach the end of each stage, and you must bomb the enemy computer terminal on stage 6 then loop back to the beginning of the game at a faster pace. You'll also need to consider your fuel tank, which you can top up by bombing the ground based fuel tankers (obviously). Enemies will also attack you from the air. Unlike the original, hazards can either be flown around or over, thanks to new perspective. This release from Hokuto Force has added docs, an infinite fuel/lives training mode, and a great high score saver. Although it doesn't appear to be NTSC fixed, the game does seem to be playable on the American video standard, but it has some graphical artifacts. If you're new to the game, I'd recommend taking the extra lives to practice the narrow corridor section of stage 5, then go for a high score run. 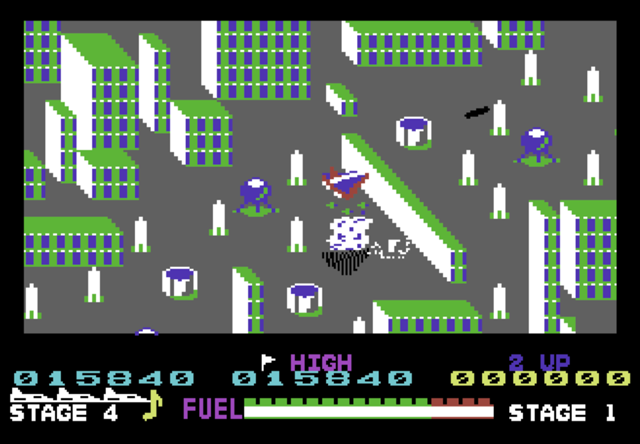 For me, it's the best version of Scramble on the C64.